What are the Different Negotiation Steps? Once the desirability of something that is being negotiated over has been established, the parties begin to discuss its value. A negotiation can generally be defined as a process that is undertaken with the goal to reach an agreement. Negotiation steps can therefore vary depending on the styles of the people who are doing the negotiating. 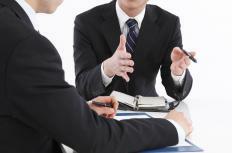 There are some steps that tend to be common in successful negotiation processes, however. These are analysis, offer, counter-offer, and agreement. People tend to negotiate because they want something that someone else has or they want to have someone else do something. One of the first negotiation steps for a person who desires something is to consider what he wants and what he has to offer. It is not always obvious what a person should seek to get from a negotiation. For example, one person may tell another that there is an attractive business that he should invest in. The person who received this tip may research the proposed business and decide that he is interested. His interest, however, could lead in many directions. He must now decide if he wants to seek employment, become a shareholder, or buy that business. Once a person knows what he wants, he needs to consider what he has to offer. If a person is negotiating a gift, he may not need to have anything more than persuasiveness. In most cases, however, a person is going to need to provide something in return for what he gets. This could be money, skills, or services. It will just depend on what he believes is attractive to the other party. After a person has done an analysis, the next of his negotiation steps will likely be to present an offer. This is a step where the person who desires something communicates with the person who has what he wants. He will generally outline to her the specifics of his desires and offer to provide something in return. It is important that he makes himself as clear as possible. Otherwise, the person that he is negotiating with is not likely to be able to make a decision. This could extend the negotiation process, because she may have to request clarification that requires him to resubmit his offer. When a person receives an offer, her role in the negotiation steps begin. Unless she chooses to ignore the offer, she must also do an analysis. First, she will generally analyze what the other person has proposed. Second, she will typically consider whether it is to her benefit to oblige and whether she is willing. If a person receives an offer and is interested but feels that adjustments need to be made, she will compose a counter-offer. This could involve simple changes, such as times of delivery or price. The person who is issuing a counter-offer may however, drastically change all of the terms that have been proposed to her. When the counter-offer is revealed, if both parties agree, they can proceed to the last of the negotiation steps. This does not often happen. In most cases, there will be a series of offers and counter-offers, with each party trying to get as much benefit as possible. When terms have been reached that the two parties agree on, they enter the agreement phase. This is generally where both parties formally consent to terms that are listed clearly so that they both understand. If the negotiation involves a contract, it would be signed at this point. It is important to note, however, that not all negotiations are successful, so the agreement phase may never be reached. What is Face Negotiation Theory? What is a Negotiation Paper? How do I Choose the Best Negotiation Class? What are the Steps in the Negotiation Process? I actually think that the first step of negotiation- analysis- is a good sign that the two sides can benefit from a transaction and are interested in it. Because two people would only negotiate something if both see things to be gained from it. Of course, the rest of the process is really important too. But if the two sides have good negotiation skills and make reasonable offers, there is no reason for why they shouldn't reach an agreement. For me, the simplest way to understand negotiation is like bargaining for something in a market. This doesn't happen in the U.S. often. But abroad in other countries, customers will usually engage in a bargain with the seller to get something for a cheaper price. It always starts out with the customer asking for a price and then making an offer that is less than what the seller asked for. If the seller doesn't like the offer, he will make another offer.The customer might raise the price a bit to reach an agreement. This continues until both the customer and the seller reach a price that makes both of them happy. doesn't always work out. The seller might refuse to sell if the customer doesn't pay enough to cover his profit margin. The customer might refuse to buy because he feels the item is overpriced. Even in such a simple negotiation, reaching an agreement is hard.